In Sakuna: Of Rice and Ruin, players take on the role of Sakuna, a proud yet lonely harvest goddess who is banished to a dangerous island with a group of outcast humans. 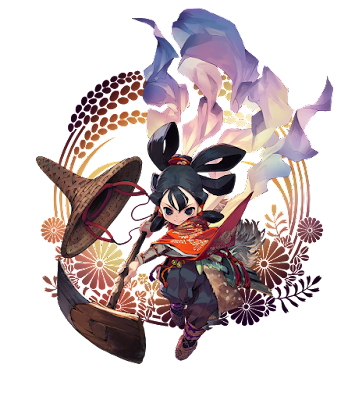 Sakuna tames the island by defeating demons using farm tools as weapons while also making ample use of her “celestial scarf,” a magical item that allows her to grapple distant enemies and platforms. Along the way, she establishes a home in a mountain village, which serves as a base of operations for crafting weapons and cooking food. Additionally, as a harvest goddess, she grows rice by following a detailed process that encompasses everything from planting to harvesting. Through this process, across each of the four seasons, she’s able to improve the harvest and hone her battle skills alike. The painstakingly researched storyline incorporates Japanese history and legend, with its heroine facing off against numerous types of demons, great and small, as she traverses detailed landscapes rich with the iconography of classic Japanese mythology. A love letter to Japanese culture, Sakuna: Of Rice and Ruin is also an ode to the artistry of cultivating rice, and features an engrossing simulation of the craft behind the agriculture.